Morphocode is an Architectural Practice working at the Intersection of Design and Technology. RABBIT 0.3 beta is out! 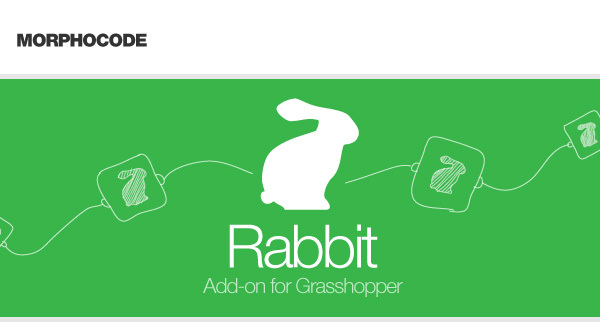 MORPHOCODE is pleased to announce that the long-awaited new version of RABBIT is out! RABBIT 0.3 is compatible with the latest version of Grasshopper at the moment(0.8.0066).This new version is equipped with a new set of icons and is simplified allowing even easier modeling of cellular automata and l-systems into Grasshopper. Rabbit 0.3 will be simplified and beautified! Hi, thanks Morphocode for the very interesting plug-in. how to do the last rule, "delete"? Hello ..... Theoretically speaking; does conway's game of life and Voronoi structures share any similarity??? I download rabbit 0.3, this is a amazing plugin! But I want to know how make "the angle scale" work. I checked your blog and can't find any command controlling this parameter. Would you tell me how to use it? Is RABBIT 0.3 available to download?.. or is there a way to use 0.2 with newer versions of Grasshopper? The work you are doing opens a lot of design avenues. Well done. Please make Rabbit 0.3 available. Seems super cool... any advise where I could get some tutorials on this plugin?